Playgrounds! 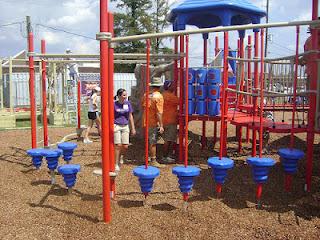 Remember play grounds from when we were younger? I sure do. I still have the scars. The playgrounds of my youth were remnants of the 70's. They were splintered wood and scalding steel structures casting ominous shadows over a hard and unforgiving bed of dirt and rocks. They were tools of natural selection. Kids would talk about the playgrounds they had survived in the same way one might reminisce about battles in a foreign war. "Remember Lone Peak?" One hollow eyed child would say while alternating between eating an Astro Pop and using it ice the dark purple bruise on his shin. "Yeah, we lost a lot of good kids there." His companion would reply, biting off the last of his blow pop and flicking the stick into the gutter. 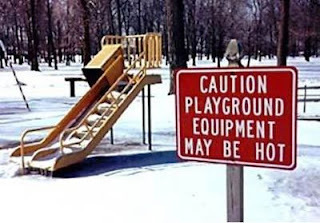 You know what would be worse than those playgrounds? Not having playgrounds. This week's Five Dollar Friday was submitted by Ask Your Dad Blog reader Carly over at Morgan Family Travels. She suggested that this week we give our five dollars to her favorite and fantastically named charity Kaboom! "KaBOOM! 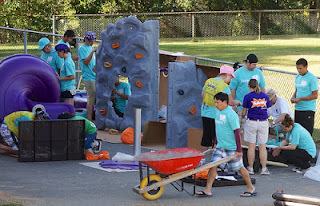 is a national non-profit dedicated to saving play for America's children. Our mission is to create great play spaces through the participation and leadership of communities. 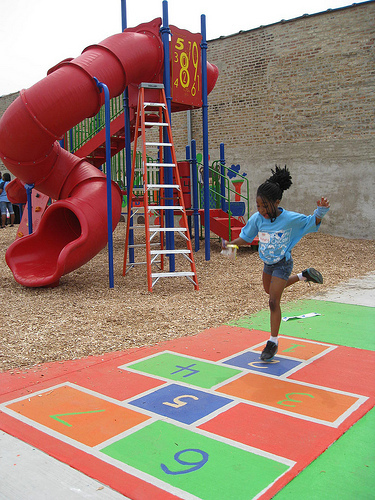 Ultimately, we envision a place to play within walking distance of every child in America." That ladder is not part of the playground. A rock climbing wall!! We only had rocks - made of rock. Their website is pretty awesome too. It not only functions as a place to accept donations, but also as an interactive map and review site to find great play grounds in your area. 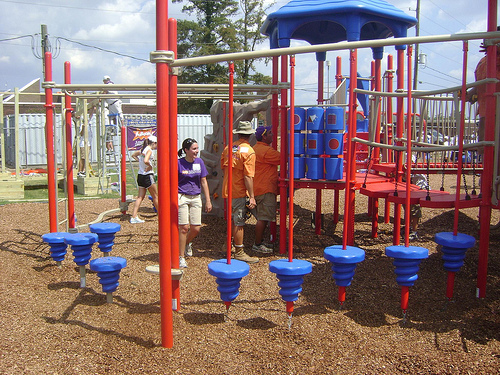 Parents can look up play grounds, read reviews and enter their own. KaBoom!!! Anyway, please join me in chipping in $5 to this fantastic group and check out their website. This is a great organization. I did my five. Love this! 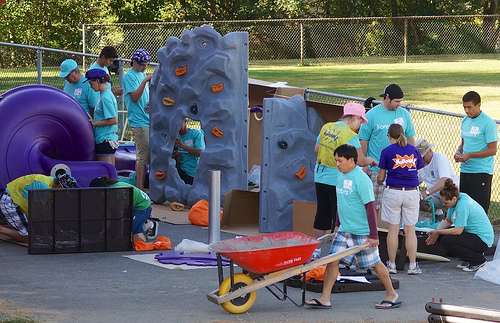 There are so many communities and children out there that could use a new playground! Not the type of organization you usually think of when considering charities, but certainly a worthy cause. I'll definitely keep it in mind!